Habit: Annual [perennial herb] often scented. Stem: prostrate to erect. Leaf: simple, opposite, sessile, narrow, bristly-ciliate, dotted with embedded oil glands. Inflorescence: heads radiate, peduncled,  in leafy cyme-like clusters; involucre cylindric to bell-shaped; phyllaries in 1 series, free, gland-dotted; receptacle epaleate. Ray Flower: as many as and subtended by phyllaries; corolla yellow. Disk Flower: few to many; corolla yellow, 5-lobed, generally 2-lipped. Fruit: cylindric, generally puberulent; pappus of bristles, scales, or awns. Habit: Annual 1--20 cm, mound-shaped; herbage spicy-scented. Stem: 1--several from base, simple or much-branched. Leaf: narrowly linear, gland-dotted on margins. 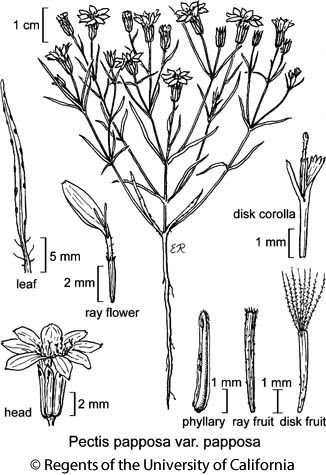 Inflorescence: heads in +- dense cyme-like clusters, 6--10 mm diam; peduncle 3--10 mm; phyllaries 8, 3--5 mm, linear, each with +- terminal gland and several smaller +- marginal glands. Ray Flower: 8; corolla 3--6 mm. Disk Flower: 6--14; corolla 2--3.5 mm. Fruit: 2--4.5 mm; pappus of ray fruit a low crown; pappus of disk fruit +- 20 +- plumose bristles (rarely a crown). Unabridged Note: A 2nd variety in Chihuahuan desert. Citation for this treatment: David J. Keil 2012, Pectis papposa var. papposa, in Jepson Flora Project (eds.) Jepson eFlora, http://ucjeps.berkeley.edu/eflora/eflora_display.php?tid=8032, accessed on April 20, 2019. © 1997 Robert E. Preston, Ph.D.
W&I, D; Markers link to CCH specimen records. Yellow markers indicate records that may provide evidence for eFlora range revision or may have georeferencing or identification issues. Purple markers indicate specimens collected from a garden, greenhouse, or other non-wild location.